Jed Kolko has some great charts on the Great American Migration (HT: MY). He recognizes the supply problem, but as most people have a tendency to do, he views these patterns implicitly through a lens of demand and consumer preferences. I think we would be better to see this entirely as a supply problem. When a bowl is full, pouring more water in just causes water to run over the top. Those who can afford to outbid incumbents for housing are the water pouring in, and those who can't afford it are the water running over. 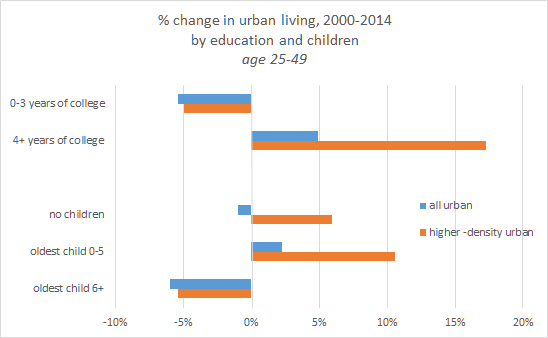 The high income households moving in are doing it by choice. There is no reason to believe that the households moving out are expressing choice in any way. They are being forced out, and the force is equal to the amount of pain they are willing to suffer before they are willing to pick up and move away from their homes. These patterns are extreme. 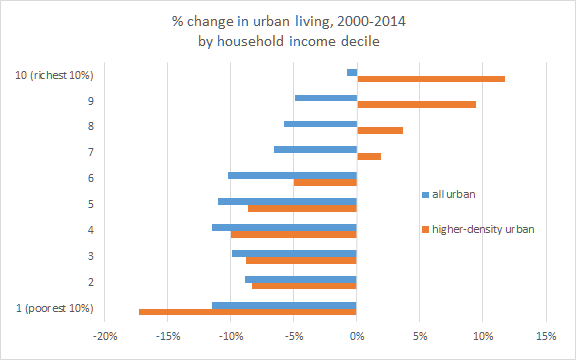 Just since 2000, among the bottom half of households, by income, there has been more than a 10% shift away from highly dense urban neighborhoods. These are essentially passively imposed forced relocations. This is the interpretation that deserves the benefit of the doubt. To explain it any other way would be like noting how the Super Bowl (where tickets now cost thousands of dollars) is overwhelmingly attended by rich people, and concluding that there has been a shift in preferences. For some reason, lower income fans just seem to lose interest in football after the regular season ends. Maybe we need to do an anthropological study about why poor fans don't care about championships as much as they care about pre-season exhibitions. There is a lot of discussion these days about increasing market power of corporations. Larry Summers has an article out on this. I think I will save a more detailed response for another post. He concludes that increasing market power is important because all the other explanations for apparent patterns of income stagnation and inequality are mysteriously incompatible with the evidence. But, he doesn't consider this housing issue. It's housing that has the increased market power. 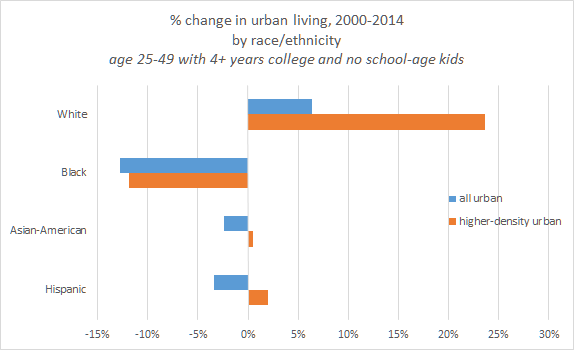 And, this power, ironically, comes mostly from "Affordable Housing" policies in the big blue cities. The frustrating thing about discussing the economy in terms of market power, is that it sets the discussion up in a satisfying "us vs. them" framing, which is really wrong about everything. It sets us up to look for confiscatory and obstructionist policies that we expect to level the playing field. It leads us to spread all of the policies that have created the problem to an even broader set of agents. We are the 100%. The solution to all of these problems is building. That means developers making profits on new buildings. It means letting cities grow. Like no other issue I have studied, this housing problem highlights the damage of "us vs. them" thinking, and the shared benefits of an open society and a free economy. I try to avoid tribal politics, but it is really distasteful to me to see the class warfare and anti-market rhetoric that imbues so much of the anti-building activism. Then, when those policies make refugees out of a sizeable portion of the working class households of those cities, the response is more class warfare. The corporations have too much power! Taxes on the rich are too low! We must be subsidizing those gauche suburbs too much! Raise the minimum wage so corporations that have too much market power have to pay poor workers enough to pay their exorbitant rents! "The business model of Wall Street is fraud." And, what was "Wall Street's" big sin? Building houses in Riverside, and Phoenix, and Atlanta for those refugees. And we put a stop to it. We are nearly unanimous in our support for the housing bust. Nothing unites America these days like our agreement on this. The policy impositions of urban activists have turned their cities into a post-modern dustbowl and the jalopies are lined up on I-10, now moving back east. How extreme does this have to get before we can expect a little introspection? Unfortunately, I'm afraid that love politics means never having to say you're sorry. I would only add, at least in Southern California, there is plenty of restrictive property zoning in towns that otherwise participate also in class warfare--but from the top down! Try building high-rise condos along the Pacific Ocean...in Newport Beach? The Inland Empire is the creation of left-wing and right-wing property zonors! Which reminds me of an old L.A. joke: how can you tell a wealthy liberal from a wealthy conservative? The liberal drives a foreign luxury car. The more I think on it (or perhaps the more you do and I read your thoughts) the less I comprehend the fear of overbuilding. I would think anyone with the interests of the poor at heart would love an overbuilding crisis. The big winners in such a crisis are renters at the time of the crisis, who tend to be poorer than owners. Overbuilding should be a transfer of wealth from rich (builders and owners) to poor (renters). Yes. And to add to the irony, there were places where rents were falling, and those were the places where a lot of homes were built. But in most of those places, prices never went up much. And we killed the housing market in those places for no reason. In the book I really end up rhetorically with the conclusion that in an open access economy, it is impossible to overbuild. It's all sunk costs. Once you build them, you consume them. It's not like you'd leave them empty because you realize you weren't wealthy enough to afford them. Once you have them, you have them. And the opportunity cost isn't from tomorrow's wealth effect, it's from whatever those workers and firms would have built instead of homes in the past. If we could have overbuilt, it wouldn't mean we weren't as wealthy as we thought we were. It would mean we were more wealthy than we thought we were, but we decided to divert production to housing over some more valuable good. But, as you and I know, price signals clearly could not divert production into housing in the cities where price signals were extreme. There are thousands of houses held off the market in Las Vegas, what should be an open access city. Right, the only reason not to sell (or for durable goods, at least rent out) something you 'overproduced' is if someone's paying you not to. I'm reminded of The Grapes of Wrath, in which the California farmers are literally willing to destroy their own 'excess' crops rather than sell them cheaply or give them to starving migrants. Ironically many people likely misinterpret that as an example of the horror and greed of the market economy, when in reality, those farmers (or their counterparts in reality) were only burning their own crops because the government was effectively paying them to do so in order to drive up prices to combat deflation. Btw, do you know when you'll be publishing your book yet? I'm working on the manuscript now. We are aiming for summer 2017, which I think is kind of a fast schedule, so I hope we can hit it. You are assuming it is do-gooders who are against property development to highest and best use. There are square miles of single-family detached housing districts in and around every major city in the US. Whatever the politics of the people in those neighborhoods, they do not want 50-story condo towers, ground-floor retail, in their neighborhood. In their own neighborhood, everyone becomes a Pinko Greenie Weenie. Read the right-wing blogs. The topic is always the minimum wage or free trade, the topic is never property zoning or the criminalization of push-cart vending. If and when the topic of property zoning is addressed, it is carefully localized to parts of the Bay Area or New York - - code words for liberals. Show me the well-to-do single-family detached neighborhood anywhere in America that is ready to forgo zoning. The the free-enterprise crushing nature of single-family detached zoning districts is never a topic. I think the appropriate response to people concerned about, say, 'preserving the character of the neighborhood' pr what have you, is that they can do whatever they want with the neighborhood, if they're willing to buy the whole neighborhood. Of course, there are likely regulations making that impossible in most cases even if one can raise enough money to do so, so the next 'best' thing is the Home Owners' Association I guess. I think there's also a certain fetishization of single family home ownership that crosses political lines that may explain some policies that are effectively subsidies for well-off people at the expense of less well-off people. Reminiscent of automatic tax breaks for employer-provided health insurance. Again, fix the freeways and you can build. Otherwise, taking the 405 will become more of a nightmare than it already is. I have no problem with more construction, if the infrastructure is fixed. But it won't be. Also, it looks like there simply need to be more apartments, since millennials cannot afford anything else. What is crazy is that NYC has the infrastructure to handle more density: a subway system. Make the subways safe (and I think they have) and clean, and build to the sky. Kevin Erdmann has pointed out Manhattan used to be more dense than now. L.A. does have a huge infrastructure problem, and a subway system designed by contractors, unions and homeowners groups. And taxi drivers--evidently that is why no subway to LAX. Or anywhere else you want to, like Dodger Stadium. I would prefer a reversal of the 1926 Supreme Court decision that cities can zone property. Make it wide open again. Cities can and should build infrastructure (through private operators). One reason cities have so little money is that the federal government for decades has sucked money out of urban regions and funneled into rural areas. But with 24 rural-state U.S. Senators, that will not change. I keep hoping for a demise of nations and the return of city-states, but I may have a long wait! That is an amazing link. Of course, LA had an extensive street car system, long ago. LA is proof is you have nice weather and even crappy infrastructure, and don't build it...they still will come.